Armstrong World Industries (AWI - Get Report) , Lennox International (LII - Get Report) , Masco (MAS - Get Report) , Owens Corning (OC - Get Report) and Vulcan Materials (VMC - Get Report) provide products and materials to all segments of the housing market, including new home construction, home resales and home improvement. Now, investors can count on gains given new plans for spending on infrastructure. These stocks are components of the PHLX Housing Index, which includes 19 components, of which 11 are homebuilders. Armstrong makes ceilings and cabinets. Lennox sells air conditioning and heating systems. Masco manufactures home improvement and building products. Owens Corning makes insulation, roofing and siding products. Vulcan Materials makes the ingredients for concrete and cement. New U.S. infrastructure spending should increase business for these companies in 2017. Here's the daily chart for Armstrong. Armstrong closed Thursday at $41, up 3.5% year to date. It is in correction territory, 10.4% below its multiyear intraday high of $45.75, set on Aug. 16. The stock is also in bull market territory, 31.7% above its Feb. 11 low of $31.13. 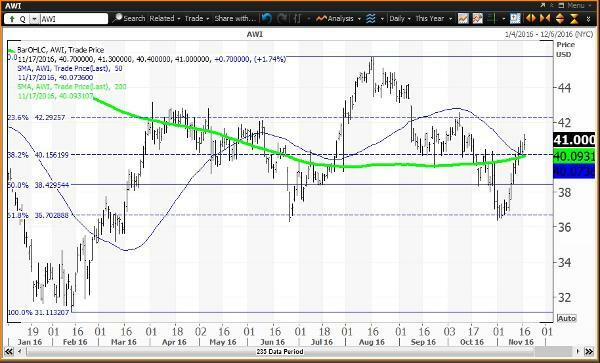 The daily chart shows the Fibonacci retracements of the rise from the Feb. 11 low to the Aug. 16 high. This stock set its all-time high of $53.64 in February 2014. Once the stock peaked on Aug. 16, it began to spiral lower. The stock dropped below its 23.6% retracement of $42.29 on Sept. 9, then below its 38.2% retracement of $40.16 on Sept. 23, but held its 200-day simple moving average, then at $39.49. The stock popped back above its 23.6% retracement of $42.29 before plunging to its 50% retracement of $38.43. The stock bounced back to the 38.2% retracement of $40.16 before plunging again to the 61.8% retracement of $36.70 on Nov. 1, which held at the low that day of $36.38. 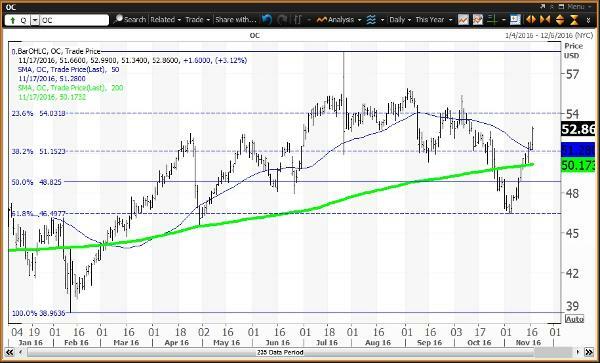 The rebound since then has the stock above its 50% and 38.2% retracements and its 200-day simple moving average of $40.13. Investors looking to buy Armstrong should buy weakness to $37.02, which is a key level on technical charts until the end of 2016. Investors looking to reduce holdings should sell strength to $41.95, which was nearly tested this week, and remains a key level on technical charts until the end of 2016. Here's the daily chart for Lennox. Lennox closed Thursday at $153.96, up 23.3% year to date and 6.1% below its all-time intraday high of $164.02 set on Sept. 2. The stock is in bull market territory, 45.7% above its Feb. 8 low of $105.65. The daily chart shows the Fibonacci retracement levels of the rally from the Feb. 8 low to the Sept. 2 high. Since setting the high, shares of Lennox moved sideways until sliding below the 23.6% retracement of $150.24 on Oct. 19. The next wave down was to $140.97 on Nov. 3, which proved to be a buying opportunity as the stock tested its 200-day simple moving average, then at $141.98, and the 38.2% retracement of $141.72. The post-election rebound has the stock above its 50-day simple moving average of $152.91. Investors looking to buy Lennox had the opportunity to buy the stock at its 200-day simple moving average, now at $143.82. Investors looking to reduce holdings sold strength to $163.41, which is a key level on technical charts until the end of November. Here's the daily chart for Masco. Masco closed Thursday at $32.25, up 14% year to date. It is in correction territory, 13.7% below its all-time intraday high of $37.37, set on July 28. The stock is also in bull market territory, 39.6% above its Feb. 8 low of $23.10. The daily chart shows the Fibonacci retracement levels of the rally from the Feb. 8 low to the July 28 high. Since the high, the stock had been moving sideways to down. The stock moved below its 23.6% retracement of $34, which became a magnet until Oct. 18. The stock moved below its 38.2% retracement of $31.92 on Oct. 25, then traded as low as $29.38 on Nov. 3, before rebounding back above its 50% and 38.2% retracements. 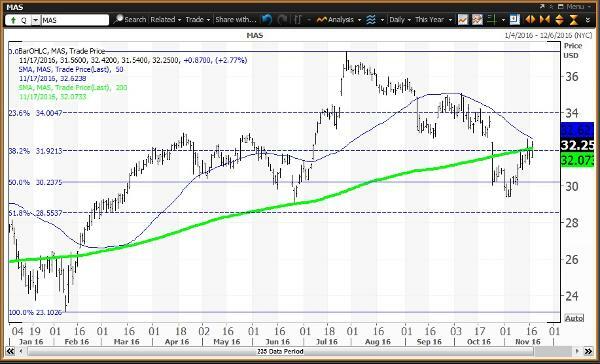 Thursday's close was above the 200-day simple moving average of $32.11. Investors looking to buy Masco could have done so at its 200-day simple moving average when it was $31.61 on Oct. 25. Investors looking to reduce holdings should sell strength to $35.32 and $36.94, which are key levels on technical charts until the end of 2016. Here's the daily chart for Owens Corning. Owens Corning closed Thursday at $52.86, up 12.4% year to date. It is 9.9% below its all-time intraday high of $58.69, set on July 27. The stock is also in bull market territory, 35.7% above its Feb. 10 low of $38.96. 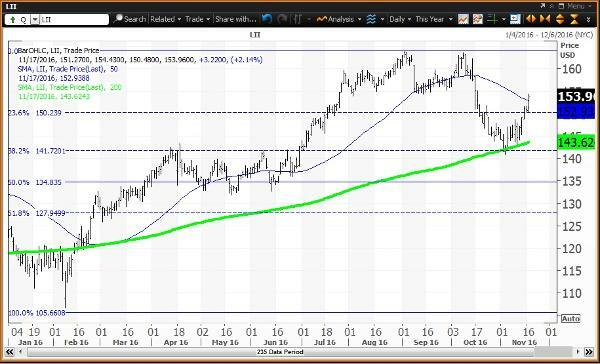 The daily chart shows the Fibonacci retracements of the rebound from the Feb. 10 low to the July 27 high. 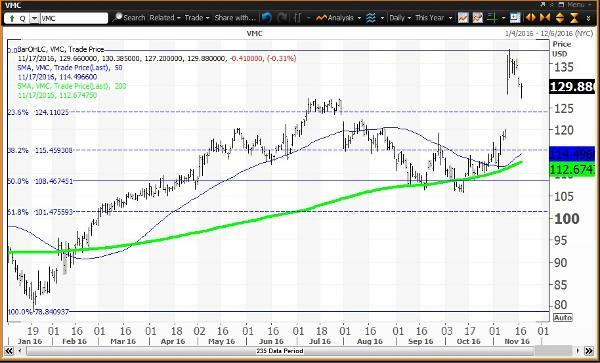 Since spiking to as high as $58.69 on July 27, the stock traded back and forth around its 23.6% retracement of $54.03 between July 28 and Oct. 7, with a low of $50.33 on Sept. 16, just below the 38.2% retracement of $51.15. The stock has been below its 38.2% retracement between Oct. 25 and Nov. 11, with a low of $46.45 on Nov. 3. That was below the 50% retracement of $48.83, but held the 61.8% retracement of $46.50 as a buying opportunity. The post-election bump has the stock back above the 50% and 38.2% retracements, heading potentially to the 23.6% retracement of $54.03. Investors looking to buy Owens Corning should buy weakness to $48.76, which was feasible to do as early as Oct. 27. This remains a key level on technical charts until the end of 2016. Investors looking to reduce holdings should sell strength to $53.58, which is a key level on technical charts until the end of 2016. Here's the daily chart for Vulcan Materials. Vulcan Materials closed Thursday at $129.88, up 36.8% year to date. It is down 6% below its all-time intraday high of $138.18, set on Nov. 10. The stock is in bull market territory, 64.8% above its Jan. 20 low of $78.83. The daily chart shows the Fibonacci retracements of the rally from the Jan. 20 low to the Nov. 10 high. Setting a new all-time high after the election is a clear sign of buying interest as the company provides the ingredients to make concrete and cement, and huge demand is expected for repairing and building infrastructure. There is a huge price gap from the Nov. 8 high of $120.11 to the Nov. 9 low of $128.06. Remember that price gaps are almost always filled. Investors looking to buy Vulcan Materials should buy weakness to $116.42, which is a key level on technical charts until the end of 2016. Investors looking to reduce holdings should sell strength to $133.44, which is a key level on technical charts until the end of 2016, and below the all-time high.